Devours the Muck! Apply every 2-4 weeks until you reach desired results. Cover 1/4 acre for $81.50. 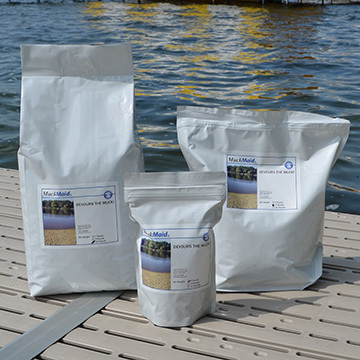 MuckMaid® is an effective pond and lake muck removal solution that will make your water crystal clear with a nice sandy bottom. MuckMaid's® bacteria and enzymes consume organic matter, resulting in effective pond and lake muck removal in just weeks! MuckMaid® will leave you with clear water and and a firm sandy bottom to enjoy. MuckMaid® is also easy to apply. Simply broadcast the pellets over the area you want clear to gain complete aquatic muck control. There are no restrictions for swimming, fishing, or other water use following application. See our Video Demonstration to view how easy it is to apply MuckMaid®. Did nothing. Maybe in a very small area this would work but not along your beach. Very expensive for small amount. Used it and didn't see any change at all. Hope to some change but not really think that's going to happen. Just starting using this last year (2016). We purchased a cabin in 2015 that had a poor shoreline. Shoreline had not been used in over 10 years. Shallow waters had thick muck from layers of decaying leaves. We purchased 10 lbs and split it up in 1 lb bags and applied every 2 weeks. By end of season we could see sand in a areas. We realize it will take several applications. This is a lesson to all to keep up with your shoreline - it will save you money in the long run. Greatly improved our pond with the first treatment. I have a 35,000 gallon Koi pond, impossible to drain and clean. Been using MuckMaid for the past five years to keep the nasty stuff off the bottom. Works great! Not too good. After three applications, the muck was still there maybe an inch gone for the season. I purchased the 1 lb trial for my 15 x 22 ft pond. Even though the advertisement says "MuckMaid® is an effective pond and lake muck removal solution that will make your water crystal clear with a nice sandy bottom." this does not prove true. After the 1 lb is finished applied as the company suggested my pond is still black with muck and smells terrible. This item is misrepresented and should be researched further before put in the market. I have used several top Muck removal products for 10 years. Muck products are always expensive for some reason - my only complaint. Prices are really the same for pond sizes with different competing products. However, MuckMaid used starting just last season, has made it possible to see sand at the bottom of the pond in lots of areas! It does take more product to cover more area - would like to spend $85 but doesn't cover what it says it will. $150 is a lot considering we also get 3 or 4 other products. Only reason I gave it 4 star and not 5 (price too high for volume). BUT - the results absolutely, 100% work! I can't tell you how hard I've worked on our 1/4 acre natural pond for years. With 3 foot long Koi and albino catfish up to 42" - it's a joy to see them swim under the surface, instead of just seeing their mouth at feeding time (used to be so dark / murky). If they'd charge $85 for the $149 volume size, that would be fair and helpful. Don't know if this will make the website or not but there is no way this small bucket covers 20,000 square feet. I have approx. 8,000 ft total and I barely did the shore lines. Who cares if it works at this price $149.00) I see others sell the same thing at Amazon for 25# I will probably do that next time.